Making a Lesson Plan - 21centuryed Tech: Digital Teacher... Welcome To The Future! So it's a snow day! The good news... it can still be an educational day. The better news, students and teachers still spend the day in an educational setting and don't have to think about making it up later. Possibly best, the learning can continue in an uninterrupted fashion. With all this in mind, it must be remembered that planning for an e-learning day does not begin with the notice of inclement weather. It begins with a teacher who starts to prepare students for blended learning while the weather is sunny and still appealing for a relaxing, warm walk in the park. Please take a moment to learn more about preparing that online lesson for your students and enjoy a new learning opportunity. 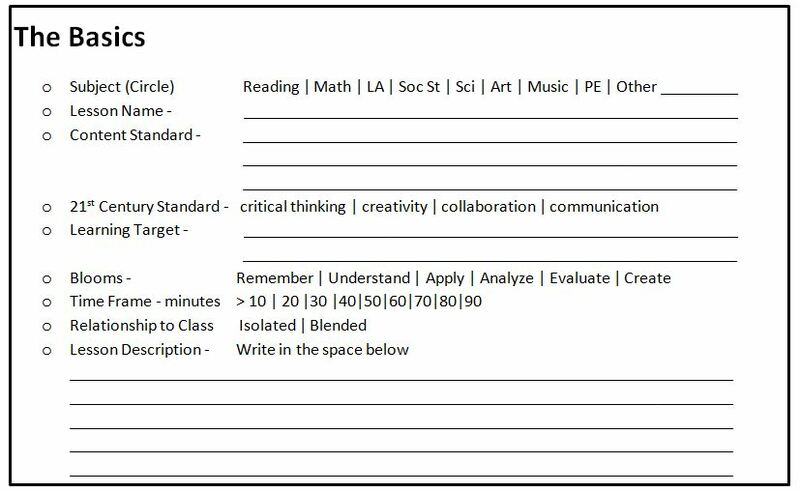 In this PD it may be helpful to download the Sample E-Learning Checklist Sheet and fill it out as you progress. Please keep in mind that this activity and journey in PD has been designed for you to own your learning. Feel free to explore where you feel it will help you best... and enjoy! Take a moment and decide what lesson might work with your e-learning experience. While it is best to always continue the flow of learning in your classroom, there may also be some ongoing themes that might be valuable to reinforce using an e-learning environment. Take a look below for some added ideas. Will there be at home guidance and supervision needed? How have you prepared your students? Have students been informed of what to do if technology is not working? Is activity grade level and age appropriate and copyright clear? Will any front loading be needed? How can this be blended into the next day? How can you support off line? Are all tool used available to students and on the district approved list? Is it possible to include some of Bloom's Higher Order Skills? How might you assess the online activity? Is differentiation needed... is so how will it be done? How might you inform parents and keep them in the loop? 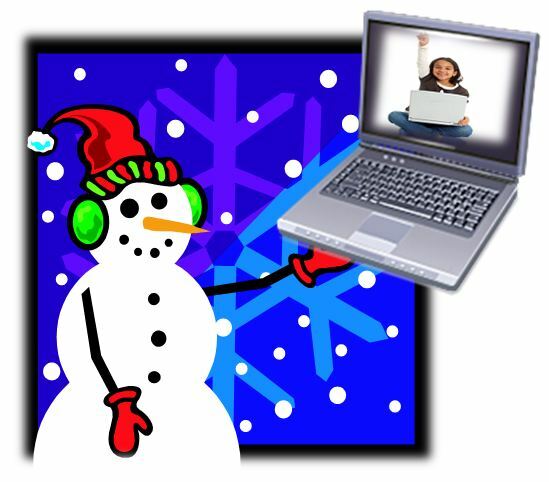 How might you be able to virtually support students on the e-learning day? Might there be a need for flexibility on due dates on the assignment? The videos below provides a look at what a sample online lesson may look like. They can be viewed as you decide how to bring the idea up or down to your grade level. Note the multistep approaches, variety of resources, and the choice for students. This can all be posted in your classroom Learning Management System. The graphic of check off sheet below demonstrates what we will focus on. There is addition information below the graphic to help you better understand some of the concepts. Please feel free to take a moment to learn and fill out as you plan your lesson. Content Standard - It is helpful to write down the standard and unpack it if that will help you plan. When you unpack take a look at nouns an verbs. Many times the Nouns will help you determine the content to be learned and the verbs will help you decide what students should be able to do. With this in mind you can then write a Learning Target. To learn more about unpacking a standard please feel free to visit this PD Link. 21st Century Standards - ﻿The 21st Century standards are often referred to as skills that students need in order to be college and career ready. These include Critical Thinking, Collaboration, Creativity, and Communication. Rather than focusing on the skills as a broad category, it is often best to break them down into skill sets. An example might be "Student contributed meaningful ideas to Discussion Forum" could be collaboration or even possibly critical thinking and communication. Many times these maybe the verbs found in the content standards. These are also many of that subsets found in the ISTE Student Standards. As students become more proficient in online learning these standards should be emphasized. Some of the below links may help you understand and give further examples. please explore if you desire. Learning Target - A Learning Target is a student friendly statement of what a student should be able to do once they have participated in the activity. As a standard is unpacked the nouns and verbs should point the teacher to what the Learning target(s) should be. Click here for a video to learn more about learning targets if you desire. ﻿Blooms Taxonomy - While there is always a place for elearning at Blooms lower skills, there should be areas in a teacher's e-learning portfolio that also focuses on the upper areas. If you need to refresh ideas on Blooms feel free to visit some below links. LMS - Also known as a Learning Management System. The Learning management System allows teachers to post lessons and assignments and for students to interact with teachers and other students. The approved LMS for the district is My Big Campus. You can learn more about how to use MBC at this link. Web 2.0 Tools and Internet Tools - These are sites that allow students to have a two way interaction. In many cases this involves a student account, or at the least causes the student to leave some sort of digital footprint. It is usually best to use tools either in the LMS or Google Drive since in most cases these are behind district security walls. The district does keep a list of approved Web Tools and you are invited to explore and use these. Before using any tools be sure to read about usage policy for that tool at SACS. If a tool is not listed on the SACS site please do not use... if it could leave a footprint or requires a student account. There is a form available to request usage for such a tool. Always make sure students have been prepared and have the digital citizenship skills to use an interactive tool. More information on approved sites, policies, usage guidelines, tutorials, and submitting a site for approval can be found at the proper link. Websites and Internet Resource(s) Web 1.0) - In most cases these are sites that deliver information to students. It could be YouTube, Wikipedia, Specialized Websites, Documents, Multimedia/Videos or Various Interactives that do not leave a footprint or require a student account. It is important that any of these sites be age appropriate and have a direct connect to stated standards and learning targets. Tools and Resources - These include a multitude of tools that the district or the State DOE have subscribed and paid for. These are rich in content and possible student engagement. They can be a perfect part of any digital e-learning lesson. It is important that any of these sites be age appropriate and have a direct connect to stated standards and learning targets. These resources include such sites as Discovery Streaming, NBC Learn, Brain Pop, Atomic Learning, NROC, and Grolier Online. Click on the live links to learn more. There may also be certain resources that are part of a curriculum adoption. Software and Apps - These refer to any legally installed and district approved software or App on a computer or iPad. Needed Front Loading in Class - Jumping into an e-learning environment is not an automatic activity, especially with younger students. A culture must be built fostering a blended classroom atmosphere. This happens long before the first e-learning assignment.Students and parents must be aware of e-learning expectations. Students might need to practice and learn how to use certain tools. Below are some thoughts and ideas for front loading. Clear Directions and Accessibility - In the planning stages it will be important to make sure that students have directions both in a printed form on to participate in an elearning activity along with specific and easy to follow directions while in the activity. Providing these directions in a parent website or news letter could be helpful. Accessibility can also be a factor. Providing some choice in activities that play out to the lowest common technology denominator could be useful. Some students may have access to a cell phone that can retrieve a You Tube video... but not a computer. Keeping ideas such as this in mind can help all students. Always consider that child with no outside access or technology. Differentiation and Special Needs - By giving students some choice in the demonstration of their learning, one can also naturally differentiate. When selecting activities that promote information, think about multiple reading levels and also delivery of information through multimedia. When using video, turn on the close captioning if available. You will assist more then the hearing impaired. Be aware of students with IEP and determine how accommodations can be met. If you have questions speak with you special education support teacher. Class Follow Up and Integration - Just as you are preloading think of how an online activity will connect when students are in the brick and mortar classroom. Discover more about the blended classroom. The online and classroom experience should compliment each other. You can learn more about Blended Learning at this PD link. As you continue the e-learning lesson plan journey you will find ways to truly create a Blended learning environment for your students. You will begin to build a learn anywhere environment which is a wonderful skill for life long learning. This is especially important in a fast paced and ever changing world. You can explore more tools and learn more about ways to blend your learning by discovering the following resources and ideas. Last, be sure to take a look at those last videos on learning about Blended Learning in 2 Minutes and 38 Seconds! Enjoy the journey! Blended Learning PD Link - Find ways to turn your elearning into true Blended Learning. Tools for Digital Lesson Creation - Explore these tools that will not only help you build lessons but will supply the needed resources. You can actually build an online lesson in about 15 minutes. SAMR Model - Learn how you can up your technology integration to the higher level of Blooms in this PD Unit. Screencast-o-matic - If you are making your own screen share video then Screencast-o-matic is a definite place to begin.